Water resources in our region support a variety of uses – residential, commercial, irrigated agriculture, mining and industrial (including meatworks, power stations and mineral refineries). Townsville’s water is supplied from Paluma Dam, Ross River Dam and, during extended drought conditions, the Burdekin Haughton Water Supply Scheme (BHWSS). Town supply for the other population centres is provided by the Burdekin River, including the Burdekin River Weir, BHWSS, and Bowen, Broken Water Supply Scheme (BBWSS). Groundwater bores supply town water for Alpha in the most southern part of our region. The expected urban and industrial growth in towns in the northern part of our region will be underpinned by water from the Burdekin Basin (Department of Energy and Water Supply, 2014). The Burdekin Basin also supports 901 km² of irrigated cropping, largely based on sugarcane in the Lower Burdekin catchment . Water used to irrigate cane crops is sourced from the groundwaters of the Burdekin Delta aquifer and Burdekin Falls Dam. Groundwater for irrigation in the Delta area has been supplemented by discharge from the Burdekin Falls Dam since it was constructed in 1987. 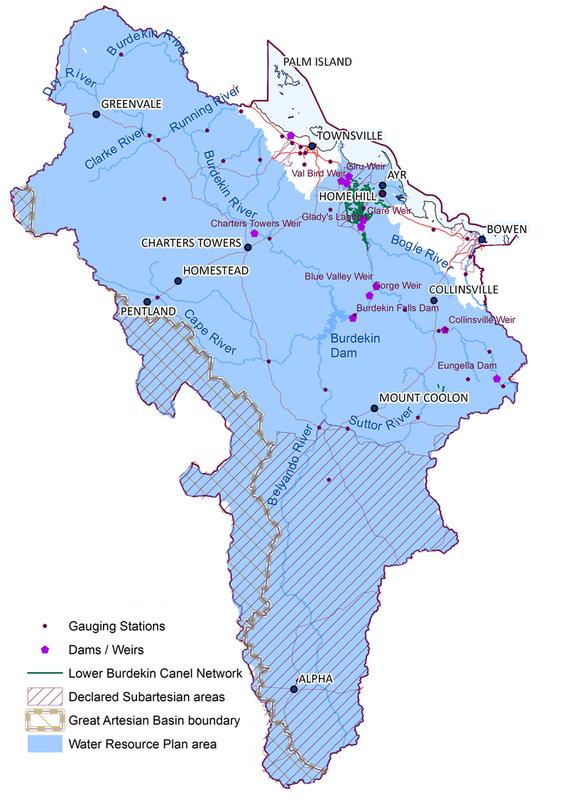 This water availability led to a major expansion of the sugarcane industry, into an area north of the Burdekin River extending to the Haughton River and Barratta Creek, which is known as the BHWSS (formally known as Burdekin River Irrigation Area). Irrigation water is supplied to farms across the BHWSS through a complex system of natural and artificial drainage channels. The soils of the area are substantially different from those of the Delta area, and are predominantly composed of more impermeable duplex soil types (Davis, 2006). This supplemented water for irrigation from the Burdekin Falls Dam has resulted in a highly modified flow regime within the rivers and creeks that dissect the Lower Burdekin catchment. Flood or furrow irrigation is most common in the sugarcane areas, with over 95 per cent of growers adopting this system to irrigate their crops (Queensland Government, 2015). The water pricing arrangements in the Lower Burdekin results in an incentive for irrigators to use the full allocation entitlement regardless of variability in actual needs particularly where individual irrigators have access to BHWSS channel water and gravity delivery (Waterhouse, et al., 2016). The impact on coastal ecosystems of the superfluous delivery of water to farms and Water Board aquifer recharge systems is further discussed in the Lower Burdekin section. The Burdekin WQIP provides further information regarding the water pricing arrangements for irrigators, including the Burdekin Water Boards. The Queensland Government is responsible for overseeing the sustainable allocation and management of both surface water and groundwater for our region under the provisions of the Water Act 2000. Since the 2005 NRM Plan, the Burdekin River Basin now has a Water Resource (Burdekin Basin) Plan 2007 (WRP) which includes a Resource Operations Plan (ROP) that deals with surface water and overland flow. A review of the WRP is due in 2017. The other river basins in our region are still under the broader responsibilities of the Water Act 2000 and are managed at the catchment scale. Groundwater in our region is also managed where the Water Regulations 2002 have identified declared sub-artesian areas, some of which also have a groundwater management area (GMA) where water sharing rules apply (See Figure 13). 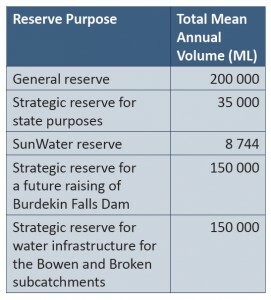 Water resource planning for the Burdekin Basin has identified reserves of unallocated water (see table below). Water is not available for allocation from the General reserve except when released for an open tender process. Water is only available from the Strategic reserve via an approved application from the Queensland Government. At the commencement of the WRP, these reserves totaled 543,000 megalitres per year (ML/yr) which are distributed across the WRP sub-catchment areas. The bulk of the General reserve occurs in the Belyando-Suttor sub-catchment (130,000ML/yr) and Lower Burdekin sub-catchment (50,000 ML/yr). While the majority of the Strategic reserve is spread across the Lower Burdekin and Haughton sub-catchments (150,000 ML/yr), Bowen and Broken sub-catchments (150,000 ML/yr) and the Belyando-Suttor sub-catchments (20,000ML/yr) (Water Planning North, 2010).